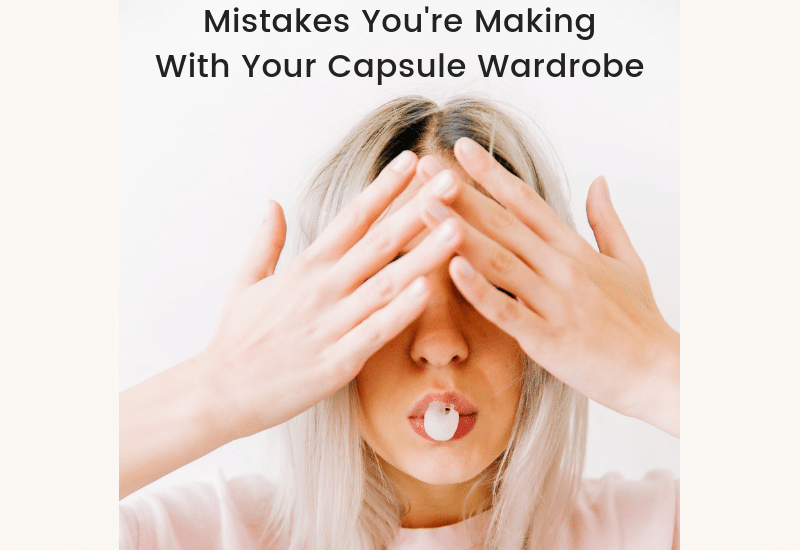 So you’ve started using the capsule wardrobe and you’re finding yourself frustrated with the process? Or you’re thinking about giving up on the whole system? Let’s take a minute and talk about the mistakes you’re making and how we can overcome them. I think that mistakes are part of the process. Anytime we try a new skill , there’s a learning curve involved and this process is no different. I have made plenty of mistakes with my capsule wardrobe and each time it’s taught me something. I’ve learned to be more selective in my clothing and to be more flexible with my rules. It’s all a part of the journey. So here are some of my mistakes, and maybe by sharing them, you’ll be able to avoid them. It can be frustrating to limit your wardrobe if you’re unsure of your style. Remember in the beginning when we removed things from our closets and just kept what we loved? 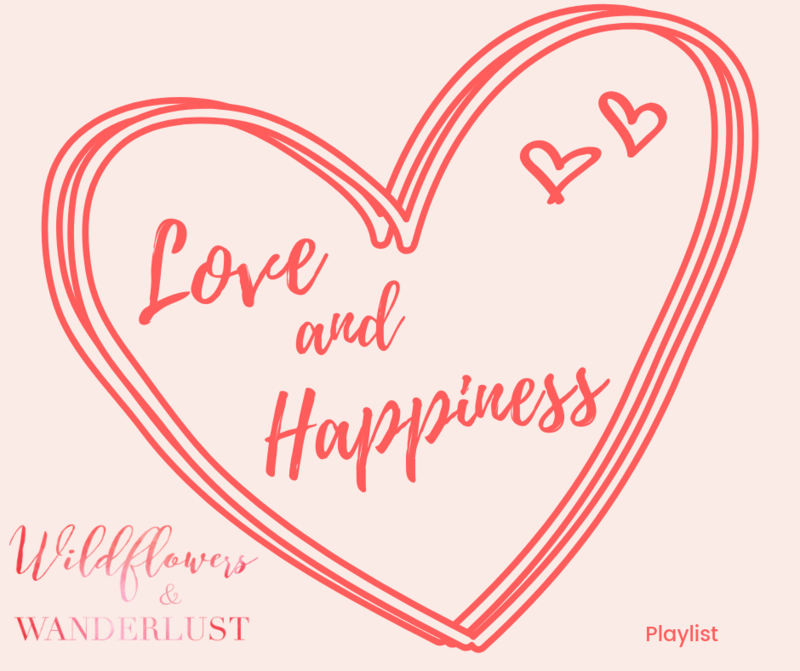 What were the pieces that you loved and why? You’re building a wardrobe based on what you feel comfortable in. You have to be sure to choose pieces that fit your lifestyle, and how you spend the majority of your time. So even if you kept that fun pair of pants, if you have nowhere to wear them then it’s frustrating. Try spending some time on Pinterest looking at style and wardrobe pictures to help you identify how you can mix up your pieces. You can easily buy the same t-shirt in several colors or even the same bottoms. Remember that the whole idea is to make it easier to dress and to feel great in what you’re wearing. It’s fine to have some trend led pieces each season, but if that’s all you’re wearing it’s going to be a bit hard to have a capsule wardrobe. The capsule is your daily wear for a season. If you’re gone out and bought all the latest trends are you able to mix and match them? Are they going to stand the test of time? It’s much easier to dress in a capsule style if you stick with mostly classic pieces and add in a few trends. This will help you save money on clothing that won’t be in style next season. You can base how many pieces on a number of items or on a percentage. But you also have to be careful of the next item. The other side of the trend equation is going to far in a direction that seems “safe”. We all need a few basic pieces in our wardrobes but by going too far into that territory we can feel stifled by our decision. I have a friend who only dresses in neutrals and she always looks fantastic. That is her style. I love bright colors, that’s my style. Jeans are a staple in my wardrobe and I have a few brightly colored tops that are easy to mix and match in my capsule. I have no problem changing them out seasonally, but it took some time to learn how. My tops are where I show off my personality. Try incorporating some accessories into the mix to keep it interesting! Scarves, jewelry or a great bag can let your personality shine without breaking the bank, and still maintaining your capsule. Even just a bright pair of earrings can change your whole outfit. When you limit the number of pieces in your wardrobe, each one of them is going to have to pull their own weight. I discovered that I was really only wearing a few items of clothing anyway. Once I figured that out it was easy to add more of the same, in different colors. 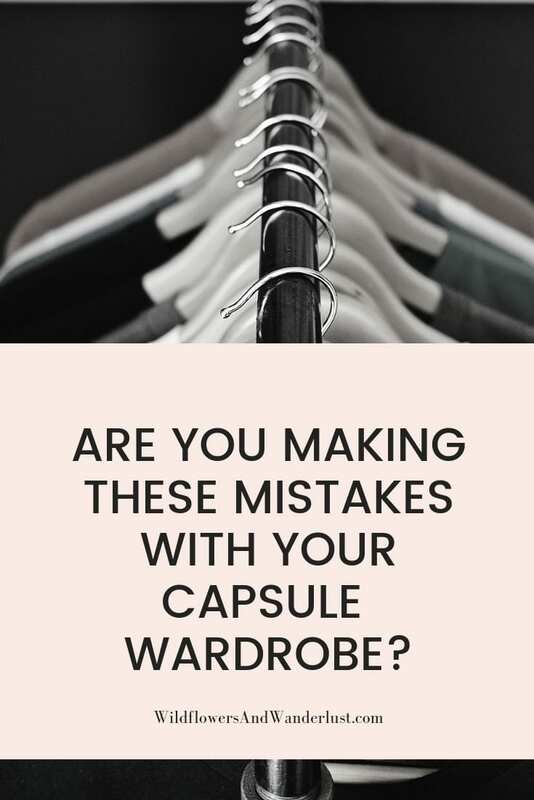 If you removed a lot of items from you closet to start your capsule wardrobe then you need to make sure the ones that are left are going to hold up. Nobody wants to wear clothes that are showing their age so make a plan for that. If you are curbing a shopping addiction then you need to stick to your list and only purchase the items on your list. If your budget doesn’t allow more clothing purchases, then make a plan to slowly replace one thing at a time with a better quality replacement. You don’t have to go overboard, you just need a plan. At the end of the day you will wind up saving money by investing in less pieces, but pieces that will last longer. I also like to touch and feel all my clothing and try it on before I commit to it so I’ve given up on trying to purchase anything online. I know that I hate to return things so it’s just easier to go shopping than stress over online return policies, and actually returning them (instead of boxing them up and leaving them on my kitchen counter for days). We all had to start somewhere with our capsule wardrobe. At the beginning, there are just lists and lists of rules and ideas on how to create a capsule wardrobe. What items you have to have in your wardrobe, how many pieces and what colors, etc. I definitely need rules and checklists and I know that a plan saves me time and money. While those rules are great to start, they are just meant to be guidelines. There is no exact number of items that you’re required to keep in your closet. What works for me is going to drive someone else crazy. My first capsule was strictly 37 items. This is the number that I picked and I was able to stick to it. It was a challenge for me and it taught me the right mindset to move forward. Now I am a bit more flexible. I don’t necessarily focus on a number, now I focus on whether the item I’m considering is going to pull it’s weight with what I already own. Does it play well with others? Occasionally I have to ignore the rules altogether and buy those silly shoes. I fell in love with some beaded sandals that I couldn’t get out of my mind, so I made a calculated purchase and decided that I would find a way to work them into my wardrobe. These sandals definitely don’t fit my “capsule” definition so I had to change my plan to work better for me. Another common mistake is copying another person’s capsule. It goes back to research again. I see lots of pretty pictures of everyone else’s wardrobe and I think “it would be so much easier to just take this list and copy it”. It might sound easier but it may cause you endless frustration. You own clothing that will already work and it needs to be taken into account. You have a style that’s all your own, there’ s no need to copy someone else. In my first capsule I only included 2 dresses because that was the number on my plan. I made it work, but I found myself frustrated because I love wearing dresses. Dresses are a large part of my wardrobe and I wear them on a pretty regular basis so I now include more of them in my capsule. I still focus on sticking to dresses that I can wear over several seasons and I can change the look of them with accessories. Your wardrobe works for you, not the other way around. Make sure that your rules that will make you happy with your wardrobe. No one is going to award you a ribbon for only wearing 37 items for 90 days, or for not shopping for 30 days. These are challenges that you can set for yourself, but don’t make your rules too hard to follow. Perfection is unattainable. The best we can hope for is to improve, and then to keep improving. Even if you nailed your capsule wardrobe for one season, next year the weather may be different, you may decide you hate that color, etc. Seasons will change, trends will change and your wardrobe will evolve. I have used the capsule concept enough times now to know that I can’t limit my season to only 90 days. We live in central Texas and summer is just plain hot, but the other 9 months of the year are somewhat erratic. We might have a temperature swing of 50 degrees in one day, and that swing can last just one day or it can last a week and then swing back. Weather like this goes a bit beyond just layering so I know that I need a few more pieces in my capsule to account for mother nature. And that’s okay. That is how my capsule is evolving to work better for me. I’m still following the basic concepts of the capsule – a limited amount of high quality clothing that fits well and I feel great in. 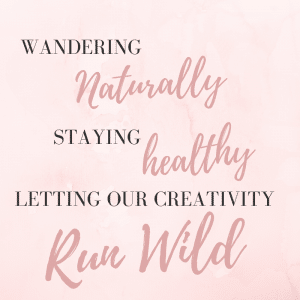 Do you remember why you wanted to Start a Capsule Wardrobe in the first place? A capsule wardrobe is a plan, not a hard and fast rule book for you to follow. It’s a concept of being mindful about what you bring into your closet. It’s to save you time, money and stress and live a better life. Have you tried a capsule wardrobe? How is it working for you and what changes have you made? Did you ever feel like giving up? Let us know in the comments below so we can hold your hand or cheer you on! !